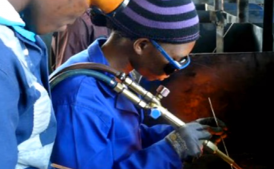 The third World Skills South Africa competition has kicked off at the Durban Exhibition Centre in KwaZulu-Natal. The competition has an array of skills on display. Learners from different schools across the province are learning that the artisanal sector is key to the country’s economic growth. The national winners will be announced on Monday. These learners say the competition has helped them to choose their career paths. “Coming here really helped me, because I learnt about robotics and storm houses that can survive flooding and about cars, not forgetting what steps to follow when I want to become a Chef,” says one learner. Meanwhile, the Deputy Director-General responsible for Skills Development in the Department of Higher Education, Zukile Mvalo, says they have conducted their own research. Mvalo says it shows an absorption rate of 79% for young people who are artisans in the workplace. “I was looking into the Q4 of Statistics SA report. It tells us that the most contributor to employment is around your crafts and related trade which means artisanal careers at 137 000 if you compare year-to-year, and 55 000 if you compare quarter-to-quarter. So it tells you therefore that those who are or who have gone through the artisanal, they are easily absorbed for employment in the country,” says Mvalo. The post World Skills South Africa competition kicks off appeared first on SABC News – Breaking news, special reports, world, business, sport coverage of all South African current events. Africa's news leader..